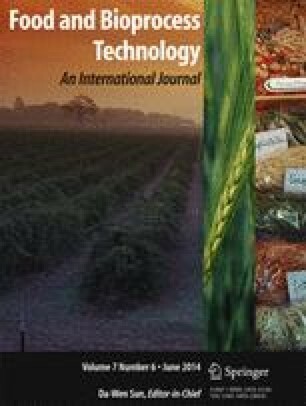 In order to give insight into β-carotene degradation mechanism during the storage of dried orange-fleshed sweet potato, and particularly into the role of isomers and norisoprenoids formation, multi-response kinetic modelling was applied. Determination of degradation compounds were carried out by HPLD-DAD and SPME-GC-MS as a function of time between 10 and 40 °C and at four water activities from 0.13 to 0.76. Kinetic modelling was developed assuming first-order reactions and by using mass balance. Eight compounds, namely, two isomers (9-cis- and 13-cis-β-carotene), two β-carotene epoxides (β-carotene 5,6 and 5,8 epoxide) and four volatile compounds (β-cyclocitral, β-ionone, 5,6-epoxy-β-ionone and dihydroactinidiolide), were integrated into two theoretical reaction schemes. The different models were discriminated according to goodness of fit to experimental data. This work showed that: (1) the formation of cis-isomers from β-carotene preceded oxidation, (2) β-cyclocitral arose directly from β-carotene scission while the other norisoprenoids resulted from β-carotene epoxide degradation, (3) cis-isomers were high reactive compounds. Temperature had a major influence on reaction rates k while water activities only impacted k at values under 0.51. Therefore, multi-response modelling is not only a tool to predict β-carotene degradation but a interesting way to select the appropriate degradation scheme based on the different options presented in literature. The authors thank HarvestPlus and DESI-funding from CIRAD for supporting the PhD thesis that generated the data that were used for this mathematical modelling. The views expressed are however those of the authors.